The Justice Department announced Tuesday that it has reached an agreement to settle its lawsuit against the $11 billion merger between American Airlines and U.S. Airways, creating the world’s largest airline, the Associated Press reports. To scale back, American and U.S. Airways would need to give up carrier slots at Ronald Reagan National Airport in Washington, D.C. and New York’s LaGuardia Airport, and gates and “associated ground facilities” at airports in Boston, Chicago, Dallas, Los Angeles and Miami, the AP reports. 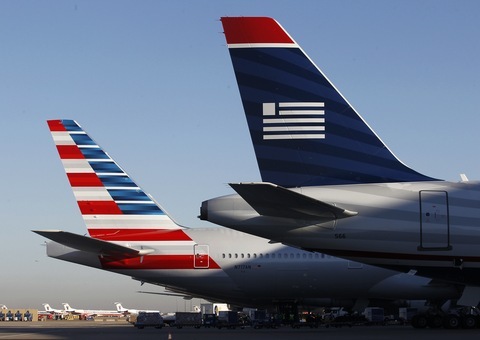 Hoping to block the merger, the U.S. government filed a lawsuit in federal court claiming that the merger would hurt competition and drive up airfares for consumers. The New York Times’ DealBook said that the settlement still needs approval from the Federal District Court in Washington and from the judge handling American Airlines’ federal bankruptcy, which the company filed two years ago. The preliminary agreement also sidesteps the need for a trial that was scheduled on November 25. Both airlines expect the merger to be finalized by mid-December. What Does the $11 Billion Dollar Airline Merger Mean for the ‘Friendly Skies’?